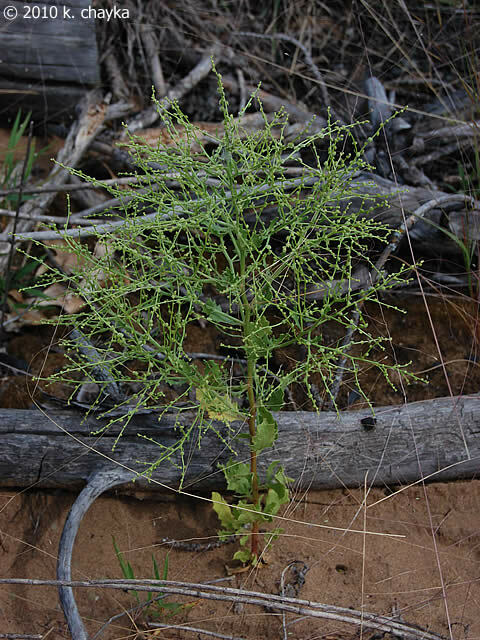 Cycloloma atriplicifolium plant. 2011 © Peter M. Dziuk. Minnesota Wildflowers. Minnesota Wildflowers. minnesotawildflowers.info (Accessed 2/2018). Cycloloma atriplicifolium is an annual, C3 herb (Jacobs 2001), a tumble-weed, 10-80 cm tall, much branched, young plants hairy. 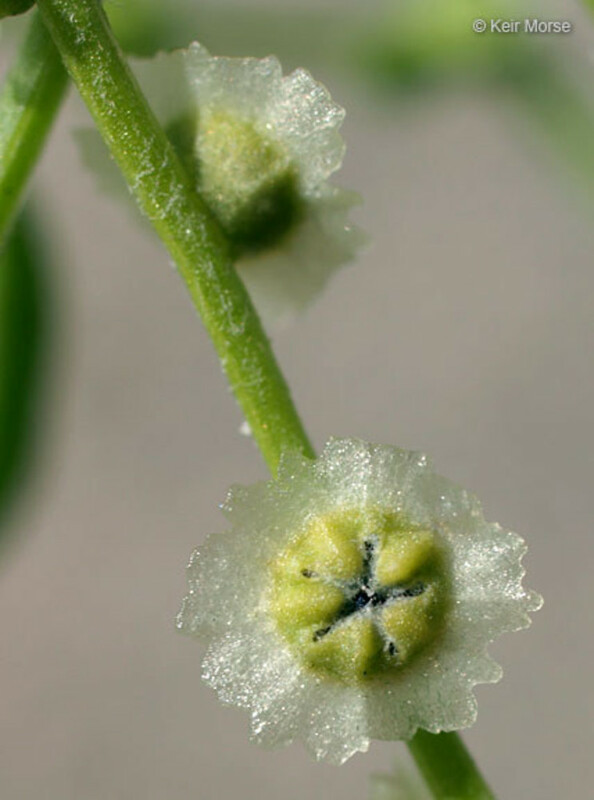 Cycloloma atriplicifolium.John Hilty. Copyright © 2015 John Hilty. Illinois Wildflowers. www.illinoiswildflowers.info (Accessed 2/2015). Leaves alternate, lower blades to 8 cm long, reduced above, pale gray-green, lance-shaped, margin with shallow, pointed lobes or large teeth, soon deciduous. Cycloloma atriplicifolium plant in bloom. 2011 © Peter M. Dziuk. Minnesota Wildflowers. minnesotawildflowers.info (Accessed 2/2018). 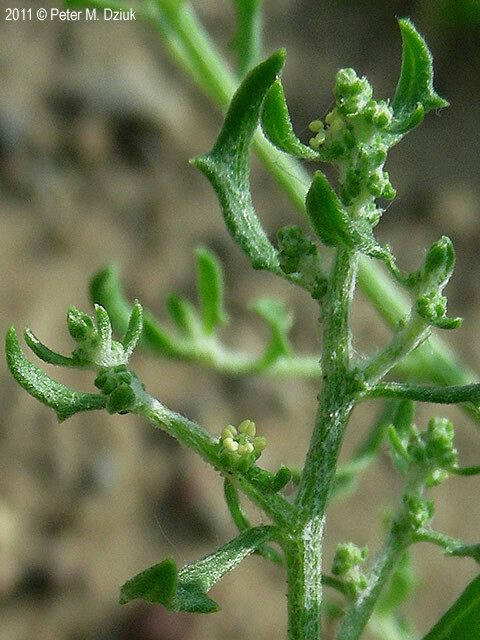 Flowers green, tiny, styles 3 (usually), calyx 5-lobed, lobes keeled, persistent, curving over and surrounding fruit; inflorescence of interrupted terminal spikes 2-6 cm long. Cycloloma atriplicifolium fruit. © Keir Morse. New England Wild Flower Society. gobotany.newenglandwild.org.jpg (Accessed 12/2014). Fruit dry, disc-shaped, 0.3-0.4 cm wide, green or purple, inner disk with 5 wedge-shaped parts, surrounded by persistent calyx and a pale, membranous, frilled wing; seeds 0.1 cm. Apparently drying, breaking off near base, seeds dispersed as plant is blown about on open ground. 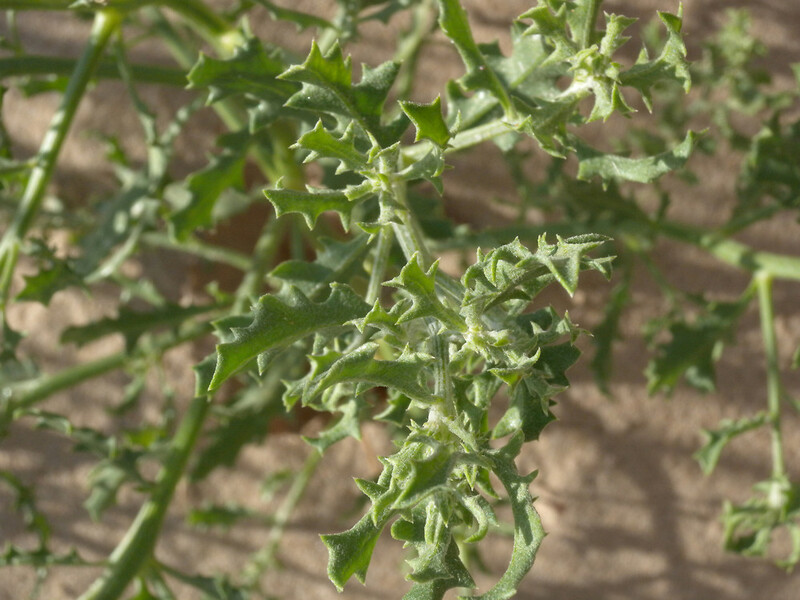 Cycloloma atriciplifolia (winged pigweed) plant in fruit. © 2010 k. chayka. Minnesota Wildflowers. minnesotawildflowers.info (Accessed 2/2018). 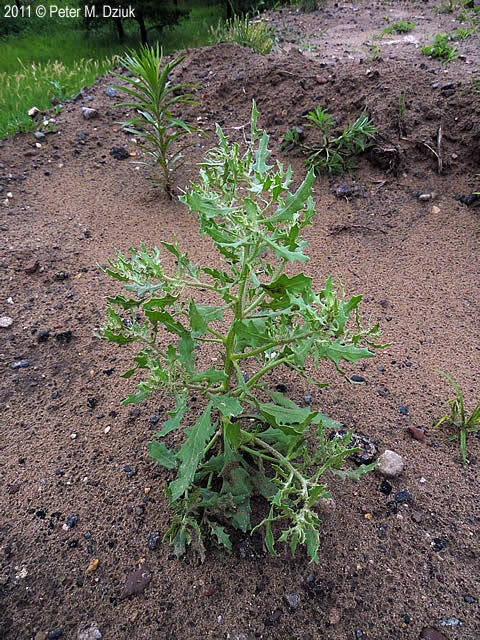 Habitat: Open, sandy soil or fill, disturbed areas, beach dunes.